KATHMANDU, Dec 22: Commercial banks have started lowering interest rates on deposits after the Nepal Bankers Association (NBA) decided to cap deposit rates amid escalation of ‘interest rates war’ in recent days. Earlier on Thursday, the NBA decided to again impose what it called ‘gentlemen’s agreement’ on deposit rates to check the skyrocketing interest rates after the umbrella organization of banks ditched a similar earlier agreement. According to the new upper limit set by the NBA, its member banks will not be allowed to offer more than 9.25 percent interest on individual fixed deposits, 8.5 percent on institutional deposits and 6.5 percent on saving deposits. Following the NBA decision, over a dozen commercial banks including Janata Bank Ltd, Nabil Bank Ltd and Mega Bank Ltd have lowered their deposit rates by publishing notices on Friday. The fixed deposit interest rates for individuals had crossed 13 percent as commercial banks jumped into a cutthroat competition to attract fresh deposits. The interest rates went through the roof after the NBA recently decided to remove a cap it had placed on the interest rates on deposits. The NBA had scrapped the cap after younger commercial banks said the cap favored bigger banks. At that time, the NBA had capped individual fixed deposit rate at 10.5 percent, institutional deposit at 10 percent and saving rate at 7 percent. 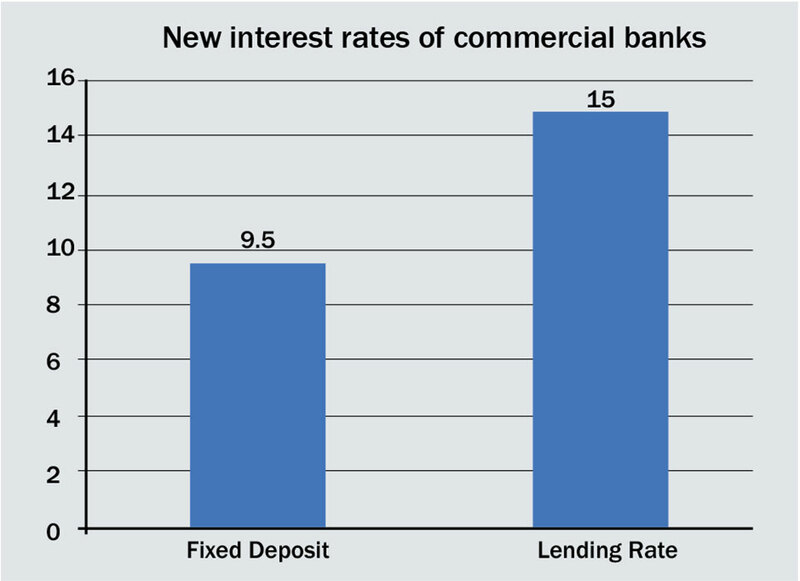 Over the past few weeks the younger commercial banks were raising their interest rates on deposits to avoid possible punitive action over the breach of the credit-to-core-capital plus deposit (CCD) ratio and bigger banks also joined the fray. Banks breaching 80 percent CCD ratio limit set by the central bank face punitive actions. Most of the commercial banks are nearing the CCD limit. The competition to raise the interest rates was dubbed by some as ‘interest rate war’. But, the NBA decided to impose new cap on interest rates after the Nepal Rastra Bank (NRB) senior officials reportedly put pressure on the NBA to end the interest rate war. “The NRB held a meeting with bankers on Wednesday to give a message that the galloping interest rates must be tamed and a cap was necessary,” a CEO of a private bank said. According to the CEO, the NRB has also given assurance that it will be ‘lenient’ toward the banks breaching the CCD ratio during the end of the second quarter when the deposits are likely to be withdrawn for tax filing purpose. Meanwhile, the Development Bankers’ Association of Nepal (DBAN) has also imposed a cap on deposit rates. According to Manoj Gyawali, an executive member of the DBAN, development banks will not be allowed to offer more than 7 percent interest on saving deposits and 10 percent on fixed deposit from next Sunday.